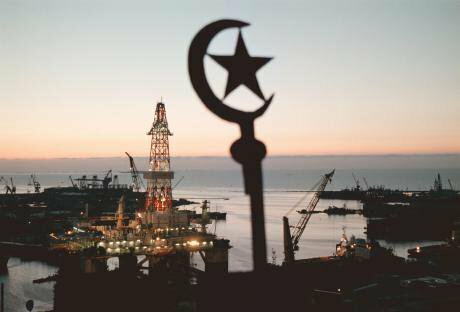 Azerbaijan's Neft Dashlari oil field has been active since the 1950s. (c) Sergei Grits / AP / Press Association Images. All rights reserved.The first four days of April 2016 saw a short conflict between Azerbaijan and Nagorno-Karabakh, supported by Armenian forces. The result was inconclusive, but it revealed the extent of polarisation in Azerbaijan and how unequal forces in the opposing camps are in this country. Few people in Azerbaijan dared to suggest that both sides might bear some responsibility for the clashes. Those who did faced a solid wall of national-patriotic fervour, which included even people who had previously called themselves liberals and human rights advocates. To find yourself beyond the borders of this patriotic front was riskier than just losing your voice in the crowd. But where did this wave of popular euphoria at the possibility of even a small victory (won at great cost) come from? The origins of the present situation go back to the first days and months of Azerbaijan’s status as an independent state after the collapse of the USSR. Just like other freshly post-Soviet countries, Azerbaijan’s new elite had to find news sources of legitimacy and select geopolitical allies. Political decisions had to be backed up by ideology, culture and education, and this ideological imperative defined the route taken towards establishing a new nation — mythologisation instead of modernisation. Creating new mythological constructs was easy enough: they were based on primordialist concepts of the unity of ethnic groups and nationalities, created in the Soviet period, whereby the dominant ethnic group in any area gave its name to that area and enjoyed a monopoly on ownership of its land. So, the borders of Azerbaijan, like those of other former Soviet republics, were defined by Soviet ethnic and nationality policies. Indeed, Soviet nationalities policy was considered the main reason for the failure of Azerbaijan’s first stage of independence and an explanation for initial external hostility. The past and present were thus lumped together, and consumers of government propaganda were fed a tale of a predetermined future as well as a clear, unshakable division of others into friends and enemies. After the collapse of the USSR, the ethno-nationalism fostered in the Soviet period became the dominant ideology of its former republics. Each of the sides in the Nagorno-Karabakh conflict appealed to the past, accusing the Soviet leadership of favouritism and aiding the enemy. Given the total propaganda immersion in both Armenia and Azerbaijan, there was no chance of any compromise — any concessions would be seen as a betrayal of national interests. 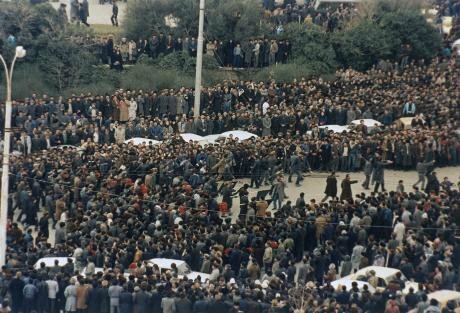 January 1990: residents of Baku gather in Kirov park with black banners to honour the more than 200 citizens who died in a storming of the city by Soviet troops. (c) AP / Press Association Images. All rights reserved.The status quo following the Nagorno-Karabakh conflict of the early 1990s has also determined today’s politics of memory. Past defeat becomes a source of victory in the future and a means of uniting the nation to achieve this crucial task. The lack of a positive outcome to Nagorno-Karabakh and the conflict’s tragic events have led to a situation where Azerbaijan’s new national ideology can present the entire population as victims. It is no longer just a question of countless and endless attacks by “insidious neighbouring peoples” and the misfortunes they bring. One key element in this vision is Azerbaijan’s crucial role in preventing geopolitical map changing “in favour of the Christian world”, accompanied by recognition of the glorious and heroic history of its people’s noble and powerful forefathers. Azerbaijan’s inability to defeat external aggression is thus the result of the number of Azerbaijan’s enemies and the lack of unity in its people. The past provides an excuse for the present: “we have always been under pressure, but we have never stopped fighting”. And given that the territory of today’s Azerbaijan was home to powerful states in the past, the loss of Nagorno-Karabakh will inevitably lead to victory in the future. The defeats of the past can be explained by Azerbaijan’s status as a victim, while the glorification and splendid history of their forefathers gives them hope for the future. Within this narrative, everything is fixed down to the last detail and everything is known in advance. Anything that doesn’t fit the reconstructed picture of the past is either tweaked or just ignored and rejected. The loss of a former identity, military defeat and the disappearance of an earlier settled way of life have led to widespread depression, despair and feelings of hopelessness among Azerbaijanis. This mood has been carefully manipulated by the political elites to further the nationalist discourse they inherited from the Soviet years. Nationalism has allowed them to unite pro-government and opposition forces for whom playing the nationalist card is a sure winner. By drawing a line between “us” and “them”, nationalism points its finger straight at the source of all misfortune — the eternal external enemy. The disparity between the glorious past and recent humiliating defeat has created a certain cognitive dissonance, but nationalism has found another enemy, without whose help its opponents would have been defeated. This is, of course, the military support given by Russia to Armenia and the Armenians. It happened this year over Nagorno-Karabakh; it happened in 1918. So a clear link is established between these two events, and we have an alliance of sworn and implacable enemies, Russia (i.e. ethnic Russians) and Armenia. In the official narrative, the scale of century-old hostility and Azerbaijan’s human loss has been gradually inflated until it reached the level of genocide — which is precisely the case with the Azeri-Armenian clashes of the early 20th century. Central to the creation of this narrative were the tragic events of late March and early April 1918, when thousands of peaceful civilians, mostly Muslims, died during clashes between Bolsheviks, units of the Armenian Revolutionary Federation (ARF) and the local Musavat (Equality) Party. 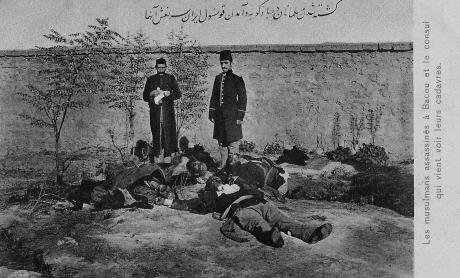 History books usually refer to these events as the “March clashes” or the “March massacre”, but in Azerbaijan they are known as the “March genocide”. This definition implies — and official figures stress this — that it was one of several acts of genocide, and the Azerbaijan government’s main task was to represent it as the pivotal one. These events were thus to serve as a demonstration of the bloodthirstiness and unscrupulousness of Armenians, and all possible resources were directed to that end. Various methods were used. Selected extracts from police interrogations of the time, with details of the atrocities supposedly committed by Bolshevik-ARF units, published in huge print runs. This Iranian postcard shows victims of the March Days in a Baku courtyard. From "March 1918" by Solmaz Rustamova / Wikipedia. Some rights reserved.Photos of Azerbaijani victims were also published — these images loom large in the secondary school history curriculum. There were articles, books, documentaries, TV programmes, all of them discussing not alternative viewpoints, but established truths. “On the Azerbaijani Genocide”, a directive signed by former Azerbaijan president Heydar Aliyev on 26 March 1998, played a major role in the commemoration of the Karabakh conflict as part of a centuries-old enmity between Armenians and Azerbaijanis, and it was this document that definitively confirmed the “genocide” as an important element in official ideology. The effective inclusion of the concept of an Azerbaijani genocide in the political lexicon was an important additional pointer for future historical research in this sphere and enabled its total ideologisation. But why did the subject of “genocide” arise in 1998? One reason was lack of ideological stability among the country’s rulers. 1998 should have been a presidential election year. It was still a long time before the “oil rain”, and Azerbaijan’s leadership didn’t have complete control over the republic’s political life. And opposition parties hadn’t yet lost their moral authority and credibility with the public. Heydar Aliyev took a number of steps to improve his image as a democrat and supporter of liberal values, both at home and abroad. Amongst other reforms, he abolished censorship and the death penalty, created a Constitutional Court and passed laws on civil and human rights and freedoms, including freedom of religion and assembly and the right to leave and enter the country at will. Among these changes, the directive “On the Azerbaijani Genocide” was first and foremost intended for internal consumption. The popularity of Aliyev, the man who had revitalised the heroic history of the Azeri people, full of suffering and deprivation, skyrocketed. The ideology of Azerbaijani nationalism, better known as “Azerbaijanism”, was a trump card in his internal political game. It was also important to choose the events of March 1918 as a key instance of genocide, rather than the clashes of 1905-1906. The latter had lasted longer, but were less well researched and less interesting — no one knows, for example, the number of fatalities, which are usually represented as a vague “thousands and thousands”. By contrast, it had been clearly established that a minimum of 12,000 people died in the tragedy of 1918. There are no figures for Armenian and Russian victims of the clashes, which once again highlights the emphasis placed on the one sided nature of the event and bolsters the “genocide” verdict. The quoted minimum is based on estimates made by the leaders of the “Musavat” Azeri nationalist party and the report drawn up by the Emergency Committee created in the summer of 1918 to investigate the March events. More figures have come to light since 1998, and are much higher than was then thought. There are now known figures for the capital Baku itself (12,000) and for the Baku region (20,000), although these figures are often confused. The history textbook for senior secondary school classes now gives an overall figure of 50,000 for all the regions affected by massacres of the Muslim population, but in 2010 Djabi Bairamov, deputy head of the Historical Institute of Azerbaijan’s Academy of Sciences, put forward a new, huge figure of 700,000. Yet another reason for concentrating on the events of 1918 is the calendar. The closeness of the dates has allowed people in both Azerbaijan and elsewhere in the world to mark the anniversary of March 1918 not long before 24 April, when the Armenian genocide is annually commemorated. Thus, events organised by the Azerbaijani diaspora around the world stress the fact that they were victims of centuries-old Armenian aggression. The success of this Azerbaijani propaganda would even seem to cast the Armenian genocide into doubt. Speaking in Ankara on the 75th anniversary of the Turkish Republic in 1999, Heydar Aliyev stated that it was the Armenians who massacred the Turks, and not the other way around. Over the years, the concept of the genocide has been modified by historians, politicians and political writers. It is no longer just a question of the extermination of Azerbaijani Turks in 1918: we now talk in terms of a poly-ethnic genocide of Tatars, Lezgins and Jews. The reasons why Armenians are supposed to hate people of these ethnicities is, however, never discussed. There is talk of more than 3,000 Jewish victims. A major role in collecting and propagating such information is played by Israel’s Azeri diaspora, especially the Azerbaijan-Israel International Association, which openly supports the Azeri government. The mention of Jews as being among the victims of the bloody events of 1918 is probably designed to elicit understanding from Israel, which is jealous of any attempt to equate any such tragic events with the Holocaust. In this context, it is also worth noting that Azerbaijan and Israel enjoy close military cooperation with one another. The most important element in the commemoration of mass tragedies is the creation of “places of memory”. The main place where the victims of March 1918 are remembered is Baku’s Avenue of the Martyrs (Shehidler Khiyabani), which is visited by thousands of people. The avenue accumulates the memory of several fateful periods. Here are buried the victims of the tragic night of 20 January 1990 and those who died in the Nagorno-Karabakh conflict. 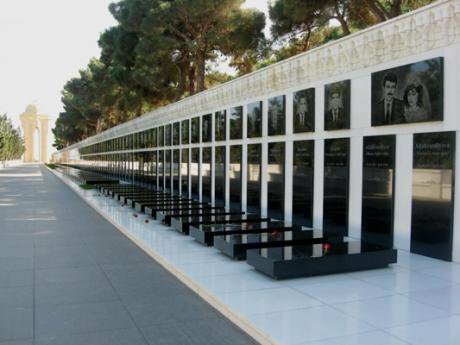 The Avenue of Martyrs, Baku. Public Domain: Interfase / Wikipedia. It is believed that those massacred in March 1918 were also buried here, but the cemetery was demolished in the Soviet years to make way for a park. So the Avenue of the Martyrs brings together the memories of all victims under one name. The use of the Islamic term “Shahid” is intended to reflect the idea that all these people did not die in vain, but were sacrificed on the altar of independence and freedom and represent a single cultural, social and historical memory of these events. The only dead excluded from the term are those who died during 1941-1945. The Azerbaijani government is very much in tune with the mood of its population and deliberately uses the term Shahid to play on people’s piety. By drip-feeding them religious rhetoric, it has aimed to speed up the desecularisation of the country and in doing so, strengthen its own hold on power — and the policy has been effective. Russians and Armenians are no longer just ethnic enemies, but part of an alien Christian world. In September 2013, another place of memory, the Guba Genocide Memorial Complex, was created and has also become a pilgrimage site in northern Azerbaijan. In 2007, a mass burial was discovered in the area, and although initially Makhmud Kerimov, president of Azerbaijan’s Academy of Sciences, warned against jumping to conclusions, suggesting that it could have been the result of an epidemic, the government propaganda machine rushed to exploit the news. Researchers, it was announced, had discovered not only the victims’ racial profiles, but their ethnicity. It was clear that they were local Azeri Muslims, Lezgins and Jews. The Prosecutor General’s office announced that it had conducted a survey of people in the Guba area, who on the basis of stories they had been told by elderly relatives believed that the bodies were of victims of a massacre carried out by an Armenian punitive detachment that had attacked the town of Guba in May 1918. The general conclusion has been that this was part of the genocide carried out by Armenians that year. The Guba Genocide Memorial Complex has been designed as a transparent and dramatic expose of Armenian brutality. This is how new memories are created, with a defining and indisputable image of the enemy at their centre. This is the feeling of shared loss and collective grief that is so essential for the unity of a nation. And anyone who fails to go along with it challenges the values and interest of their people. The Guba events are included in the history textbook used for the fifth year of Azerbaijan’s schools, e.g. 11-12 year olds. In one chapter, its authors write about an elderly woman visiting the burial site with her granddaughter and finding the skeleton of her sister, which she recognised by a medallion that had belonged to her. From the reaction of some pupils, one can say that the story’s main aim — to act on the children’s still unformed consciousness — was successful. The youngsters recalled that reading the story brought tears to their eyes; not tears of anger or a desire for revenge, but of pity, pain, compassion and unfairness. The same idea lies behind a school ritual followed every 31 March, Genocide Day. As on other dates connected with tragic events, 20 January (the “Black January” of 1990) and 26 February (the murder of innocent residents of Khojali by Armenian and CIS forces during the Nagorno-Karabakh war in 1992), this usually takes a theatrical form, with pupils dressed in mourning reading poetry, as well as competitions for drawings on the theme of war. In this way, children learn about their country’s national tragedy, absorb it and form memories of it. They then create their own historical narrative, transmuted by their own fantasy and imagination, relate it to themselves and each other and in this process gain a solid cultural and social memory of these events. This is how the image of victimhood is consolidated in the child’s mind, as is the parallel image of the Enemy, who will with each year loom ever larger and more terrifying. The pupils must understand that Armenia’s hostility has lasted for centuries, is still strong and will continue in the future. This growing generation will never even consider any possibility of peaceful coexistence. The chapter on ‘The Division of Azerbaijan’ in the fifth year Azerbaijan History textbook states: “On 21 March 1828, the day of Novruz [New Year], a fictitious ‘Armenian province’ was set up in the area of Nakhchivan and Yerevan, thus rewarding the Armenians for their treachery against our people”. And in the same textbook, in the chapter on the March 1918 massacres, we read that: “the Armenians went berserk and burned men, women and old people. Children were impaled on bayonets. These maddened Armenian executioners then collected copies of our sacred book, the Quran, made bonfires of them and threw Muslims, bound hand and foot, into them”. And as for the chapter on Stalin’s Terror of 1937, schoolchildren discover that most victims were persecuted thanks to the Armenians, in a continuation of their dastardly genocide policy. We can summarise the rest of the narrative in one passage from the eleventh year textbook (for 18 year olds): “A prominent role in the organisation of the Terror was played by… Armenians, genetic enemies of the Turkic peoples, who held senior posts in the police and security services”. This state propaganda, disguised as education, is designed to produce a generation for whom ethno-nationalism, with its stress on the tragic, and at the same time glorious, history of their country, will be central to their world view. After all, in countries which lack a developed civil society, governments monopolise and regulate all aspects of public life, and no inappropriate questions may be asked. The EU's lack of strategy is being felt in Azerbaijan. Find out more here.